Professional Farm Services Limited (known as PFS) in Cambridge is a “one stop” pump and milking machine sales and service company. We specialise in pumps of all types and milking machines from the conventional to the latest in robotic milking. We provide a full back-up service and technical expertise to support it. We cover the Waikato region, from north Hamilton, out to Raglan on the west coast and as far south as Wharepuhunga. Under the PFS umbrella are Professional Pump Services Ltd and Professional Electrical Services Ltd.
We do the design, planning, project managing, sourcing, supplying and the installation of your project, however large or small, as much or little as you need. 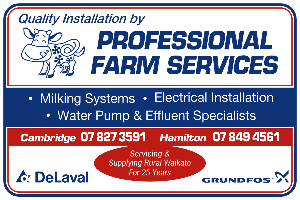 PFS has been established since 1984 supporting and servicing the rural Waikato community. Our customer base includes, amongst others, dairy and dry stock farmers, lifestyle block owners, rural residential, dairy factories and their farms as well as local district council town water supply facilities. Our service and support work is not limited to one brand only, we carry out repairs and maintenance on all brands. We are authorized main dealers for DeLaval milking systems and Grundfos water pumps. We have a full rural retail shop, well stocked and run by friendly and well trained staff, we can supply just about anything a farmer needs – just ask us! Providing excellent customer service remains a key ingredient in our business where long term customer relationships are valued. We are proud to continue to be able to offer both existing and new customers access to our 24hour/7 day a week service – just a telephone call away. Our team skills comprise accredited technicians covering NZMPTA registration (NZ Milking and Pumping Trade Assn) , water and vacuum pumps, stainless steel and aluminium welding capability, engineering, along with our qualified electricians to meet our customers' requirements. This allows us to provide our customers with a full back-up service and technical expertise as a one stop solution provider.